4 Masters (3 w/King, 1 w/Queen), 1 w/King, 1 w/2 Bunks. Sheets and Towels Provided, Beds Made. Sea Fever is located in downtown Duck in the oceanside neighborhood of Saltaire. Have the best of both worlds – terrific downtown location and only 3 lots from the beach (130 yards)! Stroll through the village of Duck and visit the quaint shops and fine restaurants. Take a walk down the soundside boardwalk which winds through maritime forest, and connects the soundside shops and restaurants. There are multiple places to stop along the boardwalk to view spectacular sunsets and abundant wildlife. There's even a kayak launch and crabbing docks. The Town of Duck has an amphitheater and town green where you can enjoy concerts, puppet shows, yoga/exercise classes, and other free events. Please note that parking is not permitted anywhere on Marlin Drive with the exception of the cul de sac near the ocean. If you park a car or golf cart there you must park within the designated areas and display the parking pass that accompanies this note or your vehicle will be subject to towing. 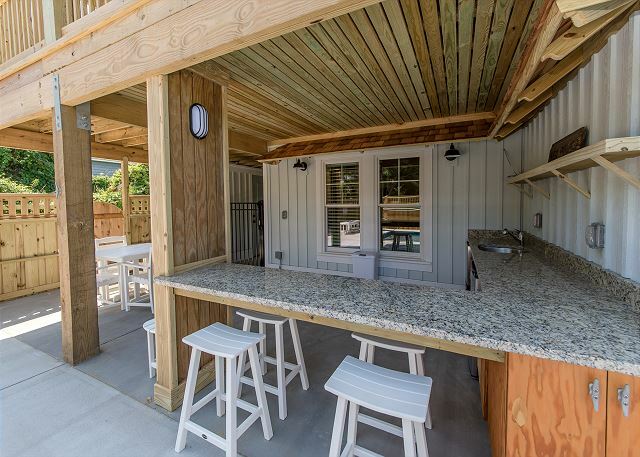 Lower Level: Outdoor Shower, Pool (12x24), Hot Tub, Tiki Bar w/Residential Icemaker. Rec Room w/Wet Bar & Refrigerator, King Bedroom, Shared Full Hall Bath, Bunk Bedroom w/2 Set of Bunks, Laundry Area w/Washer & Dryer. Mid Level: King Master Bedroom w/Walk-in Closet/Bath w/Double Sink and Walk In Shower & Access to Deck, Queen Master Bedroom w/Bath w/Sink/Tub/Shower & Access to Deck, King Master Bedroom Full Bath w/Sink/Tub/Shower. Upper Level: Living Room w/Deck Access, Dining Area, Kitchen, King Master Bedroom w/Full Bath w/Sink & Walk In Shower, Half Hall Bath. Book the week of 5/11/19 and receive Free Pool Heat - a $400 value! The property has great amenities both inside and out. Really enjoyed the heated pool, hot tub and the location to downtown Duck. 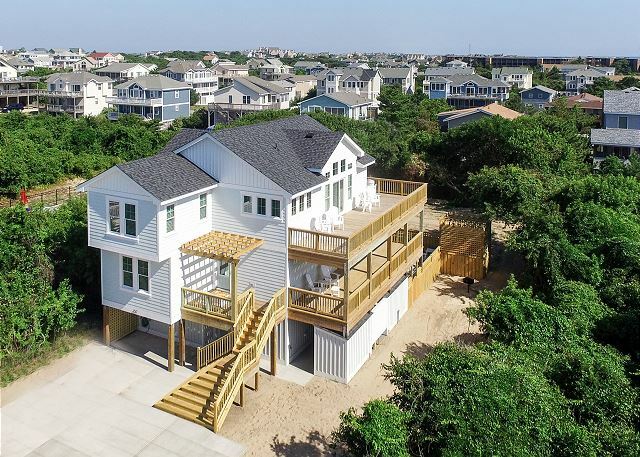 "Great Beach House" is great review for an owner and also for Kitty Hawk Rentals as well. This is a wonderful house, well laid out for family gathering or quiet space to read that book you brought with you. Hope you family had the opportunity to walk the sound front boardwalk in Duck. This is such a relaxing and close look at the sound and its wildlife as well. We look forward to having your family join us at "Sea Fever" for many vacations in the future. Love Sea Fever. This was our second stay. Unfortunately hurricane Florence shortened our stay. We were evacuated Tuesday. Wish we had been able to stay longer, but nature happens. That is the only reason I did not give Sea Fever a 5 star ratingWe are planning to return next year. "Short but Sweet" is an appropriate review for your short stay at "Sea Fever". The owners of Sea Fever work very hard to make sure their guests do feel very comfortable and can relax during their vacation. We look forward to your returning to "Sea Fever" so you can enjoy an entire vacation. The house was amazing. We had plenty of room for the 13 adults that were staying for the week. The kitchen had exceeded our expectations in regards to being stocked with plenty of utensils, glasses and coffee cups. It was a nice surprise to have 2 dishwashers and definitely came in use for this large group. There was plenty of counter space and the island was perfect for small gatherings. The house is up to date, clean and with plenty of amenities. The property description was very accurate. We loved the location since we walked to most places in Duck. The house is a short distance to the beach access. We enjoyed that the house was located on a quiet street. We would highly recommend this property. Wonderful that "Sea Fever" fulfilled all your family's expectations on your vacation. Being a new home, it provides all the upgrades and amenities inside and out that a family expects on their vacation. Being close to Duck of course is so nice, to just minutes to great food venues and shops for everyone to check out. Hopefully your family had the opportunity to stroll along the wonderful sound side boardwalk which is such a great adventure to be able to be so up close to the sound and see hopefully all the water fowl, maybe crabs and even some beautiful wild flowers as well. 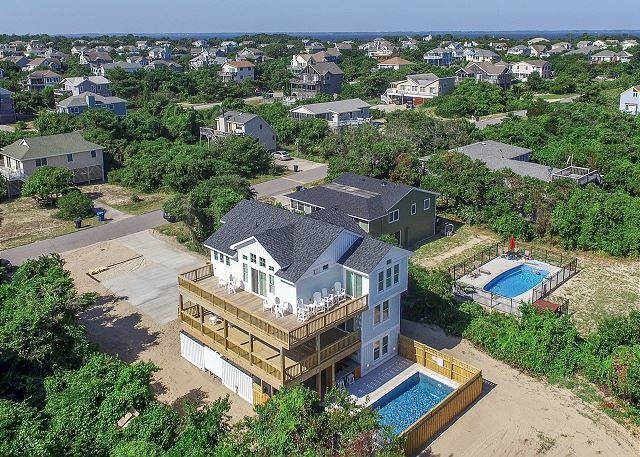 Kitty Hawk Rentals looks forward to having your family join us at "Sea Fever" for many vacations to the Outer Banks. 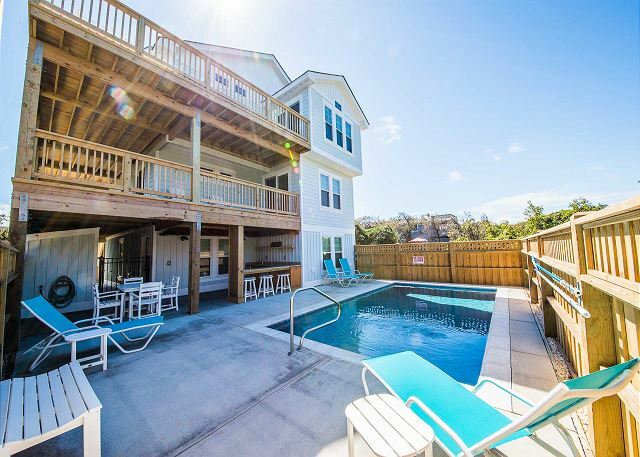 Thank you for recently submitting a review for our property "Sea Fever", taking the time to let us know how your experience was is very important to us and we appreciate you feedback. This is a beautiful home, and we couldn't be more pleased that you enjoyed all that this home has to offer. 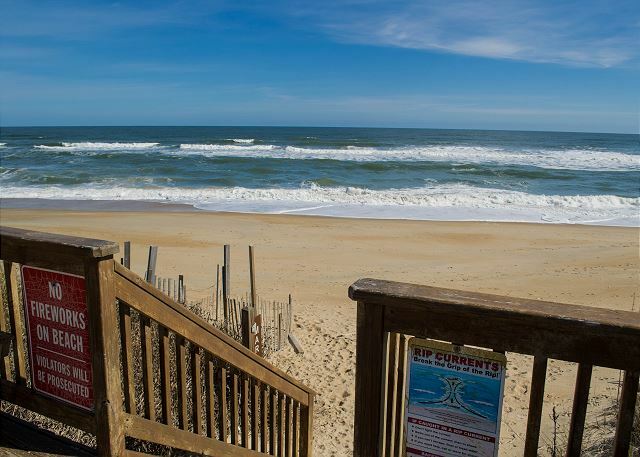 We do hope that you will consider staying with us again here at Kitty Hawk Rentals, "Sea Fever" hope to see you for many years to come. 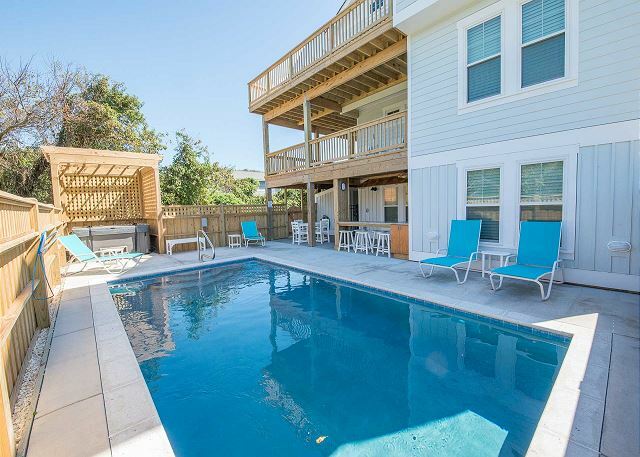 We loved our week in OBX and Sea Fever was the perfect house for the 13 of us. The day after we arrived we received a lovely welcome basket full of edible goodies. The house is only a few years old so it was spotless, well decorated and in excellent condition. We loved the layout of the house with the bunk room and rec room in the lower level for the children to have an area to play when inside. We loved how each level had access to a deck. The decks had plenty of comfortable chairs and the middle level deck had a cool swing which we all enjoyed. The kitchen was very well stocked with everything you needed to prepare and serve a meal. We were thrilled to find a pack and play and high chair since we had a baby in our group. It was an easy walk to the beach with a wooden ramp access to the beach. It was great having the pool and jacuzzi ( gate to entrance so kids could not get in) The pool area had a nice shaded area so we feed the kids lunch there several times. There was plenty of comfortable chairs around the pool and a charcoal grill outside the pool area that we used one night to make hamburgers. We had a few minor problems and maintenance was there almost immediately to fix them. We loved being in Duck this year. Close to a convenient store, boardwalk full of unique shops, crabbing dock, good restaurants and must have ice cream and Duck Donuts. The town of Duck offers free shows and activities at their beautiful amphitheater which we took advantage of for the children. It took us 50 mins. to get to Manteo to see the "Lost Colony" which was excellent. Another evening we went to Jockey Ridge Park to walk the giant sand dune and get a family picture. One suggestion. If you need to pull cars in the stoned in area off the driveway make sure your back tires remain on the concrete so you do not get stuck in the stones. I highly recommend Sea Fever as a perfect rental property and when we come back as a family we would stay there again. "The Perfect Beach House" is such a great review for any home to receive. 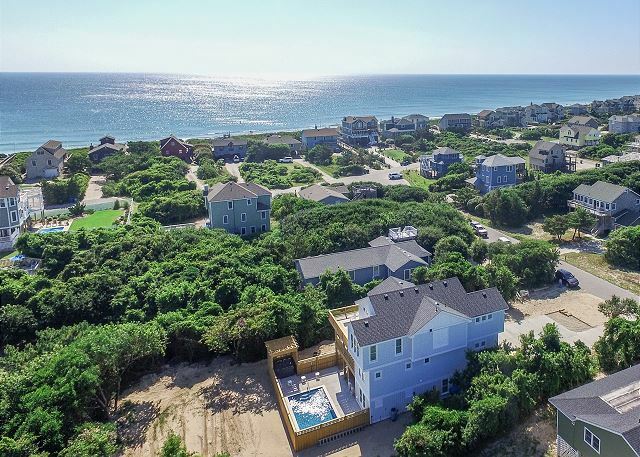 Its really sounds like your family took advantage of all the many activities and places to go and enjoy across the Outer Banks. If you went to Duck Donuts then you enjoyed the best of the best donuts and very addictive as well. The owner will be so pleased to hear that "Sea Fever" was a perfect fit for your family. Please do join us again at "Sea Fever" for many more vacations in the future. What a beautiful vacation home to spend time with the family after not being together for over 2 years. Three generations came from three states to have time to spend time with each other and the beach. The accommodations couldn't have been better. A lovely welcome basket was nice too. The weather was nearly 100 degrees when we arrived, although the water was cold, warming a bit later. We experienced a nice rain one evening that provided a fabulous light show all around us for more than two hours. The weather remained nice with the exception of Friday when it rained, but we enjoyed the shops close by. We ate many delicious meals, eating too much and some things probably that we wouldn't ordinarily do - but what are vacations for? The kitchen worked well with many helping hands and appropriate pans and dishes. Two evenings we were delighted with deer - one-night two deer came through and another night one bedded down and sat comfortably for over an hour not hindered by our talking and swimming in the pool. It was a fabulous place to spend time with family. Thank you for your recent review of our property "Sea Fever", this is such a great review and truly captures the true essence of this lovely home. We are very delighted that you had a wonderful stay with us, I am certain the owners will be thrilled that you enjoyed their beautiful home! We welcome you back to "Sea Fever" anytime and hope to see you for many years to come. The week began with windy weather due to Huricane Irma. 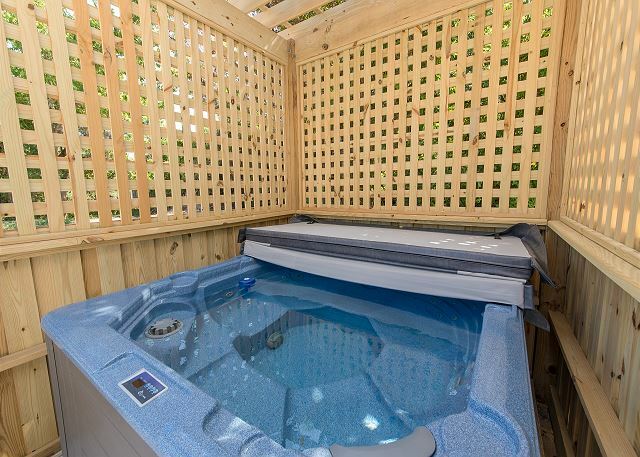 Luckily the was a pool and hot tub at Sea fever as well as plenty of room for the family to hang out. The rest of the week was beautiful . Days started with walks on the boardwalk followed by beach time. Our weather has been certainly up and down during this summer. But so glad to hear that your family did take advantage of the days of sunshine and enjoyed your vacation. The boardwalk in Duck is absolutely such a unique and calming experience being on the Sound and hopefully seeing all the birds and wildlife in their habitats. 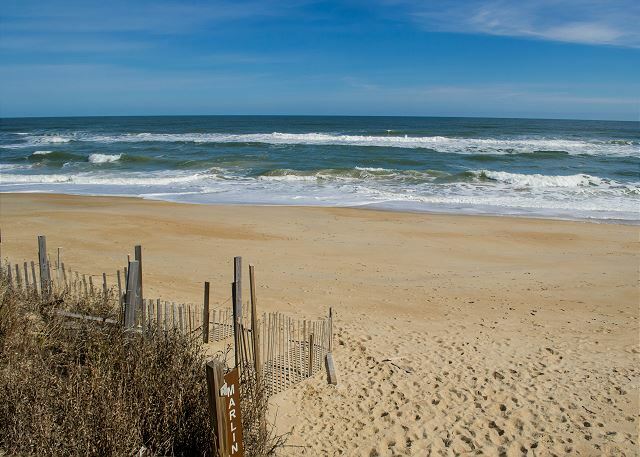 Please join us again for a September vacation, which is one my favorite times of the year here on the Outer Banks, for many more vacations in the future. We loved our stay at Sea Fever. The house was beautiful, comfortable and well equipped with everything we needed for our relaxing week at the beach. It was a short walk to the beach and into town. We are so pleased to hear that your family time at "Sea Fever" was enjoyed by all. 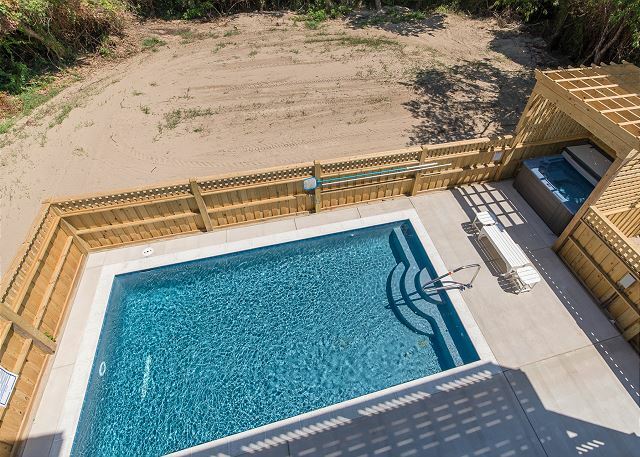 This is a lovely newer home with its amenities and closeness to the beach. We look forward to having your family join us for many vacations in the future here on the Outer Banks. WONDERFUL! - Will definitely stay here again! We had such a wonderful stay at this place. The rooms and bathrooms are spacious, there are multiple community areas to enjoy the company you are with, and the rental team was so friendly and helpful. We are already planning our next stay! Thank you so much for your recent review of our property "Sea Fever", we couldn't be more delighted that you enjoyed this gorgeous home! We would welcome you back anytime with open arms and hope to see you soon, we have a few extras planned for 2018 to make this awesome home even better! We had a wonderful vacation at Sea Fever. The house was beautiful, clean, and big enough for our 3 families. It was close to the beach and the boardwalk. 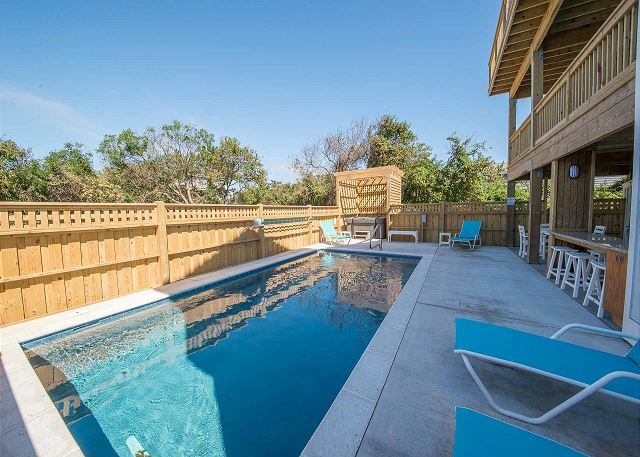 We enjoyed the pool and hot tub and would recommend this house to anyone wanting to vacation in Duck, NC. So very pleased to know that your choice of "Sea Fever" was just right for your large group. This house was built with its guest in mind with all the amenities and large rooms. 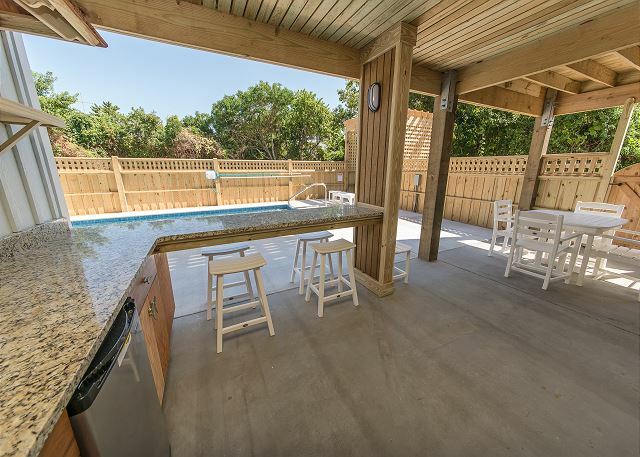 Having a pool & hot tub is always nice when you have been at the beach and want to just relax in the pool in the quiet or sit n the hot tub in the evening. Thank you for recommending "Sea Fever" to all who visit out website for their vacation as well. Looking forward to having your group back in 2019 for another amazing vacation here on the Outer Banks. The house was perfect, rooms were spacious. Kitchen with two dishwashers was a plus with so many people. Pool great size and outdoor space with kicthen was a bonus for the kids. Our experience at Sea Fever surpassed our expectations by far. We were anxious about being the first renters in a new property, however we shouldn't have been worried. The property was gorgeous, and although we had a few glitches, the responses we received to remedy the situations were prompt and courteous. 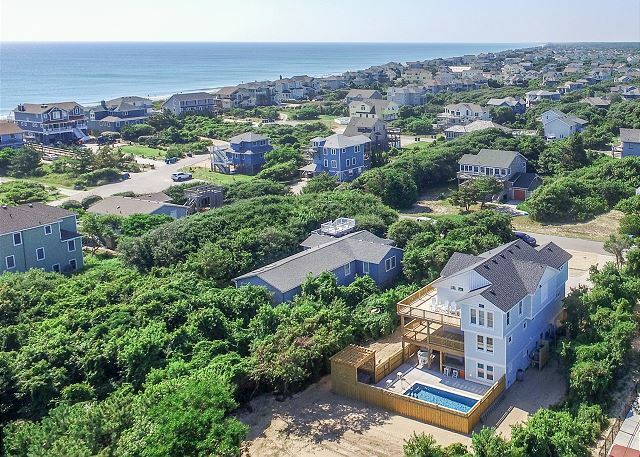 I would highly recommend both this property and using Beach Realty to anyone who desires a vacation in the Outer Banks, and would love to come back to Sea Fever in the future! Thank you again! Especially for the wine and bread received as a welcome gift! Could not have been more pleased! The home was clean and decorated beautifully. Beach Realty was great to work with. We had a great time in Sea Fever. Upon arrival, we were shocked that the house still had a "new house smell" and looked like a model home. 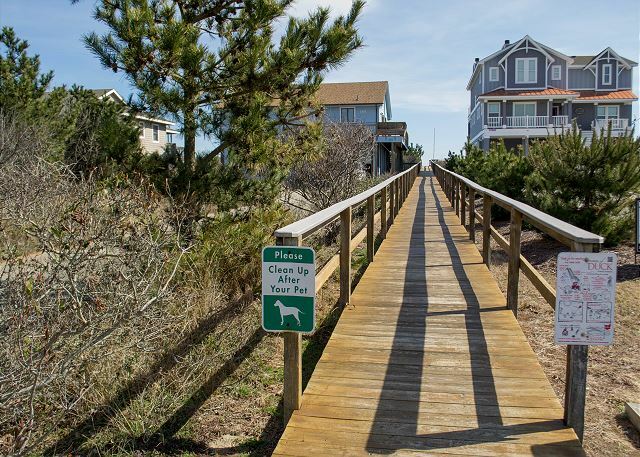 We loved the walk-ability of the location to the Duck boardwalk and to the beach. It came with many new amenities and was in close to perfect shape. It was tastefully decorated and really just plain beautiful. We already booked for next year. A few hiccups with the driveway gravel just needing to be pounded in a little (van got stuck) and the first floor main door not having a deadbolt allowing our toddler to bust out at random (the one downside to keyless-- could use a chain or some other form of security). It also could use more seating in the living room fora house that sleeps 14, but can only sit 6 in the main living room. We cannot wait to go back and really hope it remains available to rent. Thank you for your recent review of our property "Sea Fever" 3652, we are so happy that you enjoyed your stay and yes I do love the "new" house smell as well! 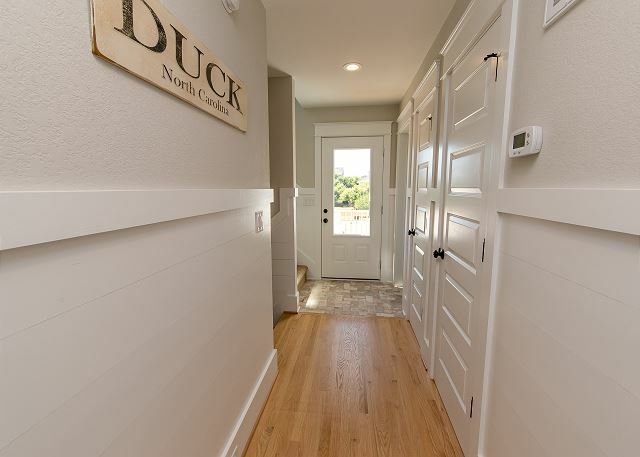 Your suggestions have been passed to the homeowner for consideration as we value your opinion and would love to see you back in this beautiful property the next time you are in Duck! We really enjoyed our stay at "Sea Fever". Such a great house! I would recommend it very highly. We had a great time. Customer service was great! Thank You Beach Realty! 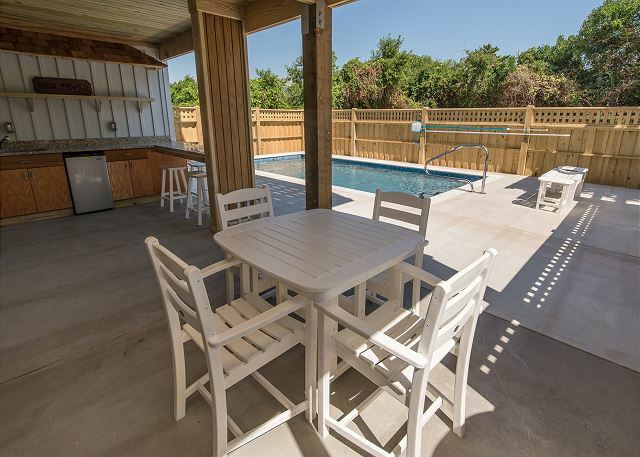 Kitty Hawk Rentals is so pleased to hear that your family enjoyed your stay at "Sea Fever". This is a brand new home this season. It's proximity to Duck makes the home even more attractable, being so near all the shoppes, restaurants and having access to the great boardwalk in Duck along the soundfront. Please join again for many more vacations in the future. Thank you so much for letting Kitty Hawk Rentals know that you enjoyed the home. We welcome your family back for many vacations in the future at "Sea Fever". We are very pleased that your family found the house met your expectations while on vacation. Please do join us for many more vacations in the future here on the Outer Banks. This was the perfect spot for a beach weekend. Being a short walk from the beach and a short walk from all of the shops in the heart of Duck was a perfect balance for our group. The house was spotless and the kitchen was fantastic for hosting a huge group. We grilled out 2 of the nights of our stay and had a blast doing happy hour on the porch. Highly recommend Sea Fever to any large group looking to explore the outer banks! Thank you for your recent review of our property "Sea Fever", we are very excited and pleased that you have an enjoyable stay. This is a beautiful home and is very well appointed plus you can't beat the location! 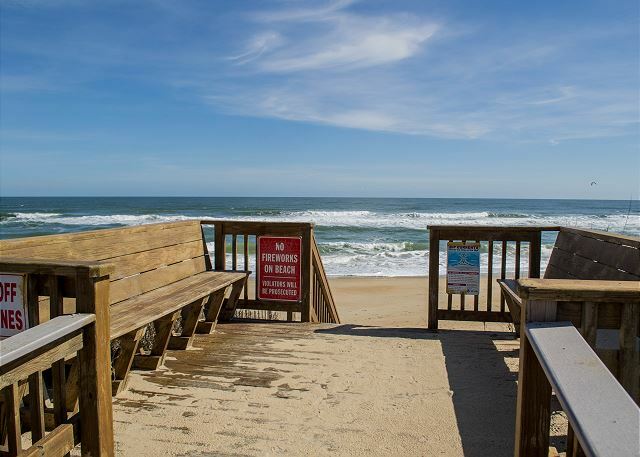 We hope the next time you are planning a trip to the Outer Banks you will give us a call here at Kitty Hawk Rentals.